I was perusing my recipe index the other day and decided that the cupcake section was too chocolate-heavy. Not that there's anything wrong with chocolate, but I'm an equal-opportunity cupcake lover. So off I went to find a non-chocolate, non-fruity cupcake flavor. Dulce de leche has been on my radar for a long time (plus it's all the rage right now), but I've always been hesitant to go through the high-risk process of making it at home. It involves boiling a can of sweetened condensed milk, bad news for accident-prone little me. So I decided to spend the extra dollar and buy a can at my local Latino grocery store (I later spotted it in the ethnic foods section at Safeway if you're not lucky enough to live near a Latino grocer). That dollar was completely worth it. Rich, moist brown-sugary cake, topped with a rich dulce de leche buttercream and drizzled with a bit of straight-up melted dulce de leche. These are equally worthy of a special occasion or a work lunch on a random Tuesday. ¡Buen provecho! 1. Preheat oven to 325 degrees. Grease a standard 12-cup muffin pan or insert paper liners. 2. In a medium bowl, whisk the flour, baking powder and salt. Set aside. 3. In the bowl of an electric mixer, cream together the sugars and butter. Add the eggs and vanilla until combined. Alternate the flour mixture with the milk until you get a smooth batter. Spoon into the muffin pan wells equally, about 2/3 full. 4. Bake for 18-20 minutes, or until a testter comes out clean. Cool completely before frosting. Cream together softened butter and powdered sugar on low using an electric mixer. Add cream, salt, and vanilla and beat on medium speed until smooth and no lumps appear. Scrape down the sides of the bowl. Add the prepared dulce de leche and beat to incorporate. Frost cooled cupcakes using a knife or a pastry bag and tip. Oh yeah. I too am scared to try my hand at Dulce de Leche, but it might be fun to try =D. Oh boy - I may have to give these a try...my mouth is watering right now (and it's not even 9am)! Good decision! I always tend toward chocolate too, but caramel or caramel-like is my second choice. I never thought to look for dulce de leche at a Latin market - I've always paid a small fortune for it at Whole Foods. Not anymore! Those look FABULOUS! I wish I had one right now...I've noticed the Dulce de Leche trend as well - have you seen this cake by sporkorfoon? Hi, I was searching for a recipe for an ice cake for a dinner party tomorrow night and I follow wives with knives & popped across your blog! Your blog is different than most & Fun! I love it! Such pretty cupcakes! I bet they taste wonderful too! Really delicious! I'm also prone to kitchen disasters, but I've tried making Dulce de leche myself and all went fine. It was just time consuming ... Those cans were very popular among my friends as gifts because you can't by Dulce de leche here. I just finished making these (no, literally, I'm typing this in the kitchen), and I'm so excited for these cupcakes to cool so I can eat one! I just tried the frosting and it is absolutely DIVINE. Probably one of the best frostings I have ever had the pleasure of tasting. Just made these, I added about a teaspoon of cinnamon to the cake batter...thought all that sweet deserved a little spice. :-D Turned out beautifully and delish. Thanks for the recipe! Chuli & Pablo - Thanks for your observation! The cupcake recipe is meant to mimick the flavor of DDL, while the frosting actually does contain it. Cheers! Thank you for your answer Amy!! Do you think there's a way to add the DDL on the cupcake mix? I'm from argentina and here we're big lovers of Dulce de Leche (and the creators also!). I'd love to make DDL cupcakes... If you think of a way, PLEASE let me know! Your blog is awesome! Chuli & Pablo - thanks for your kind words! I'd recommend filling the cupcakes with DDL. You can see a great example of this in the recipe I adapted this from (click on where it says "adapted from justJENN Recipes" in my recipe). I'm not sure that adding some to the batter would work out very well, but can't say for sure since I've never tried it. Good luck! made these today. they were a hit! very tasty. I'd love to think this to my blog. Please let me know if thats okay. I love your blog... and cupcakes! Thank you so much for sharing your delicious recipes. You Rock! Hi Amy! I was searching for a way to use up extra homemade dulce de leche from the holidays when I found your blog. I just made these cupcakes and they were SO good! The only change I made was to add a dollop of extra dulce de leche into the cupcakes before banking for a gooey center. Thanks for sharing this wonderful recipe! Im from Uruguay and dulce de leche is really common in here! everyone loves it! 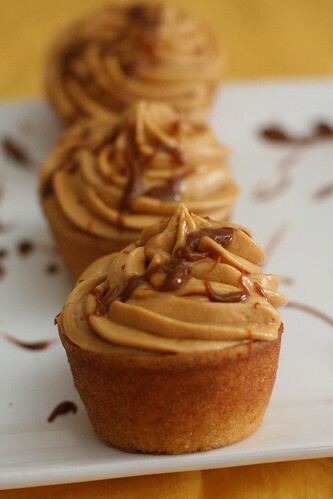 it is the first time i see a dulce de leche cupcake recipe! i did it and turned out terrific! thanks! !